Dual Circuit Low Noise Minimum Foot Print MRI Scanner Chiller. ​Recently Refcool was tasked by a highly respected Refrigeration Contractor based in the Channel Islands to provide a competitive proposal for a 64kW dual circuit, low noise chiller with small footprint to replace a failed unit which had suffered the loss of one refrigeration circuit and corrosion damage from the sea air. 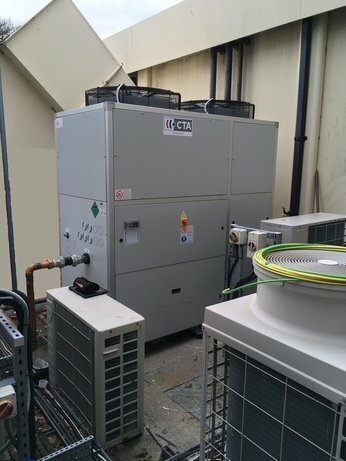 A chiller of this capacity would typically be a single circuit configuration but in this instance it was imperative to have a dual circuit chiller for the security of operation of the equipment that it serves. An additional requirement was that the aluminium condenser be specially coated for protection from this corrosive atmosphere. Refcool was successful and working closely with our partners, delivered and commissioned this special chiller on time within an agreed tight timeframe.